We try to get up early on the weekend. Not as early as on a weekday, but as most people do, we only get two days a week that are our own, so we like to stretch it out and pack in as much as we can into the daylight hours. We have both been exhausted from a very busy November, so this morning we both slept in. It surprised me that I could stay in bed for almost 10 hours, but clearly, it was needed. When I finally got up and made coffee, I was hungry! All of that sleeping was hard work. So I set about to make a quick breakfast, well brunch actually, because it was too late in the morning to call the meal breakfast in my books. I had a hankering for avocado on toast. I have long loved avocado slices on a sandwich. I adore homemade guacamole (especially my homemade guacamole), but I only recently discovered the lusciousness of eating a lightly seasoned avocado mashed on a slice of toast. The heat from the toasted bread brings out the rich and unctuous nature of an avocado. Eating the avocado simply on its own on a grainy slice of toasted bread lets the avocado be the star. Since avocado contains “good” fat, it is healthy too. I sort of felt like having an egg, but I wasn’t feeling very ambitious, so I put it to a vote. Bjorn voted “yes” to an egg, so the above sandwich was born. I’m sure Bjorn would have enjoyed a fried egg, but I’m not very good at frying eggs, so the egg ended up scrambled in a little bit of butter. While the eggs were slowly cooking, I toasted 4 slices of grainy and fiberous New England Brown Bread by Country Hearth. This bread is a staple in our pantry. There are only 90 calories and 4 grams of fiber in a slice of this stuff. It has become my favorite bread for toast. I sliced and slightly mashed an avocado, and stirred in a shot of lime juice, a pinch of red pepper flakes, salt and pepper- all of which I consider to be essential seasonings for an avocado. I also sliced a ripe, red tomato. Once the eggs were mostly set, I added shredded Colby Jack cheese, chopped fresh chives and a little salt and pepper. I lightly buttered one slice of toast –this bread is very grainy, and is pretty dry without cheese, butter or some other spread on it– and mashed 1/2 of the avocado on to the other slice for each sandwich. I piled on the eggs, and sliced tomatoes. The last step was to salt and pepper the tomato slices lightly. 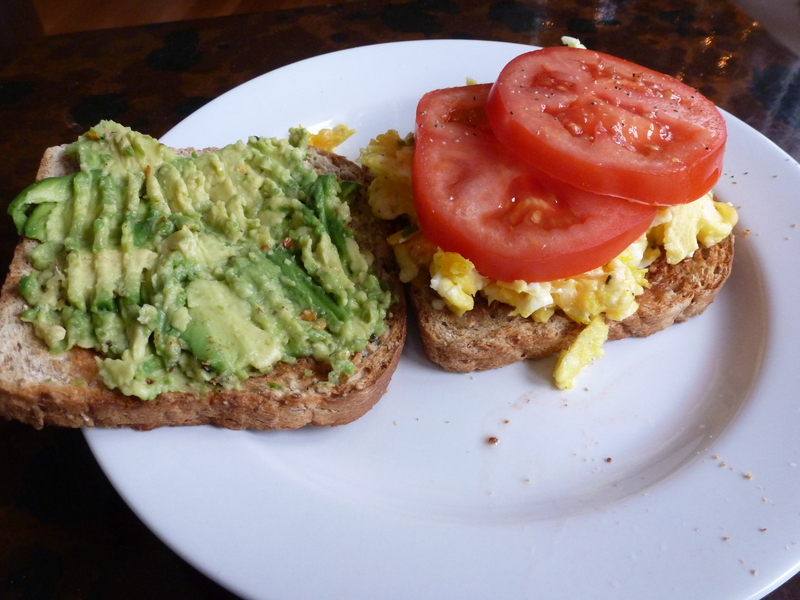 Eggs, avocado and tomato are all foods that taste best with a little salt and pepper. Seasoning each element of the sandwich kicks up the flavor, it is just as important to use a very light touch on each so the sandwich doesn’t become too salty and peppery as a whole. 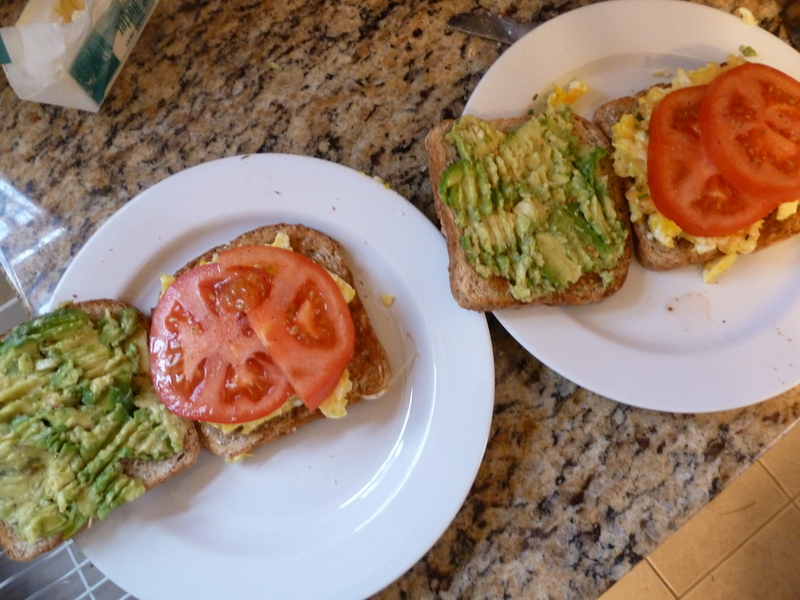 I put the avocado-topped slice of toast on top of the egg and tomato slice, Bjorn ate his open-faced. Either way is great. The sandwich is tasty and gave me plenty of energy to get moving and make something of the day. 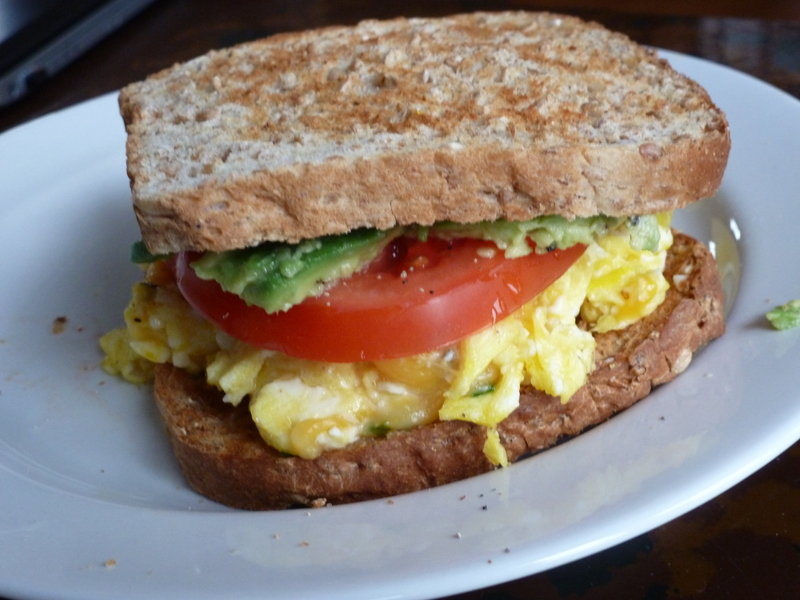 This entry was posted in Brunch, Quick, Vegetarian and tagged Avocado, Butter, Chives, Colby Jack Cheese, New England Brown Bread, Red Pepper Flakes, Salt and Pepper, Scrambled Eggs by Our Way to Eat. Bookmark the permalink.